· Elizabeth Miller, “Worldly Affiliations: Artistic Practice, National Identity, and Modernism in India, 1930–1990 by Sonal Khullar, and: Postcolonial Modernism: Art and Decolonization in Twentieth-Century Nigeria by Chika Okeke-Agulu,” The Comparatist 40 (2016), 338-346. · Fred Smith. Review of Okeke-Agulu, Chika, Postcolonial Modernism: Art and Decolonization in Twentieth-Century Nigeria. H-AfrArts, H-Net Reviews. October, 2016. 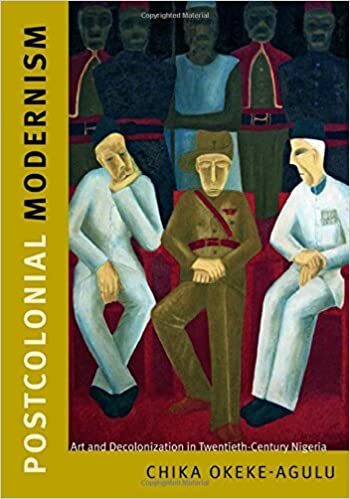 · Jean M. Borgatti, “Postcolonial Modernism: Art and Decolonization in Twentieth Century Nigeria. By Chika Okeke-Agulu.” International Journal of African Historical Studies 49: 1 (2016), 144-145. · Joseph L. Underwood, “Framing African Modernism: A Defining Decade for Nigerian Art,” Art Journal 75:2 (summer 2016), 94-97. · Helena Cantone, “Chika Okeke-Agulu. 2015. Postcolonial Modernism: Art and Decolonization in Twentieth-Century Nigeria,” African Studies Quarterly 16 no. 2 (2016), 125-127. · M. R. Vendryes, Choice: A publication of the Association of College and Research Libraries 53: 1 (Sept. 2015), 54. · Carol Thompson, Art Papers (sept/Oct., 2015), 53. · Tajudeen Sowole, “Postcolonial Modernism: Chika Okeke-Agulu Probes the Heart of Nigerian Art,” The Guardian (Lagos), Apr. 12, 2015, p. 34.